Having a modern kitchen today is literally an obsession, but a justified one. A beautiful kitchen can make life’s most boring moments come alive, in addition to the fact that it can add a touch of brightness and beauty to the house as a whole. A fundamental element to a beautiful kitchen is definitely a beautiful kitchen countertop. As the fundamental element that it is, it is absolutely normal that a wide variety of materials used to make it exist. Quite frankly, a lot of materials used for countertops exist, one just as beautiful or even more beautiful than the other but here, our focus will be on one particular material that did not leave us indifferent because of its stunning beauty; the Calacatta marble. It is a thick type of marble made up of white and gold’s or thick grey/black veining. Its bold veining is one of the features that differentiate it from some of the other marble types who rather have lighter veining. Plus, it has a soothing white background that combines with all its other features to produce the incredible masterpiece of beauty that it is. What Does This Type of Marble Have that makes it so Special? You are fully aware of the fact that several types of marble exist, but just as several types of diamond exist, there are some more precious and beautiful than others. In the case of marble, Calacatta Marble is one of the most expensive. Originating from Italy, it is highly sought after not only for its elegant, stunning and highly distinctive look, but also for its rarity. – Its Original look: This original look is due to its thick veining that differs in several ways from other marble types. However, it is more expensive than the other types of marble. This price difference we can say is worth the beauty of this material. Because of the highly elegant look it offers, it has been used in many historical places around the world, particularly in Italy where it comes from. – Its Rarity: It is widely known that, the harder it is to acquire, the more special and precious it is considered to be. Originating from only one quarry in the world, the production of Calacatta marble is very limited and becomes even more limited in some particular seasons due to more challenging quarrying making it very rare, in addition to it being hard to acquire. – Its Unicity: This marble is even more special due to the fact that no two slabs of it look the same unless it is bookmatched. However, when you put two stones together, they match up. So, if you want your kitchen countertop to be unique, Calacatta marble is for you. 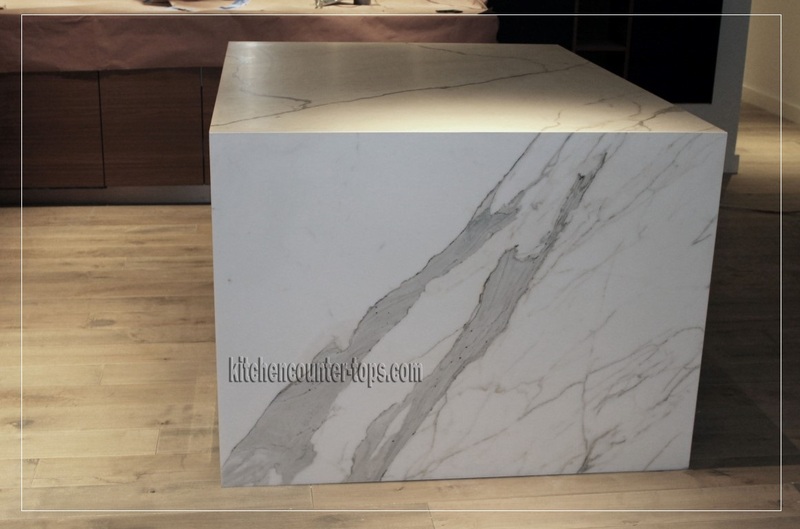 Having seen the touch of unicity and elegance Calacatta marble will offer you; we advise you go for it if you desire to have a stunning countertop. Despite its cost, it is a worthy investment, which by the way is widely used by clients in New York City and the Hamptons.. Finally, if you want to stand out from the flock, go for Calacatta Marble.